Setting goals is great! I love setting goals and recommend it as one of the most important steps in my 7-Day Productivity Plan. Goals let you measure when you’re being truly productive instead of just being active and working on things that don’t matter. Goals are the yardstick by which you measure your progress and success. However, when you set BIG goals they can seem very distant and unachievable. You look at where you are now and think about all the things you need to do to reach your goal and the journey can seem really scary. It’s a bit like how you might feel before a long-haul flight. I flew from Auckland back to the UK last year (I’m English but live in New Zealand). The destination and the idea of a holiday sounds great, but the 24 hours of sitting that you have to endure before you get there is far less exciting. This can lead to the feeling that you’ll never reach your goal. It’s just too far away. This is what causes people to procrastinate and fail to even start on a new project or idea (last week I wrote about how to overcome procrastination). One of the first steps I recommend people take after they‘ve created a large goal or vision is to dissect that goal into smaller steps. When you do this, it’s much easier to see the path you need to take to reach your goal. It’s a bit like if you’re standing at the edge of a lake trying to get to an island in the middle. It can seem really hard to reach. The smaller tasks you need to complete are like stepping-stones on the surface of the lake that you can hop across to reach the island. Creating a path in front of you like this can instantly boost your motivation as the goal appears much more achievable. 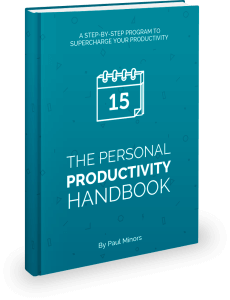 The other advantage of creating these smaller tasks is that it’s easier to schedule your time. With smaller tasks you can allocate 30 or 60 minute blocks of time to specific items on your to-do list. You can’t schedule time for “build website”, but you can allocate blocks of time for: “buy domain name”, “write ‘about’ page” and “publish first blog post”. I was listening to the DIY Video Guys podcast recently and the hosts were talking about movie editing tips. One of the issues they brought up was when you’re going through hours of footage and how daunting it can be to sort the good clips from the bad. When you sort through the footage in Final Cut Pro you are “zoomed in” and you’re working on one clip at a time. When you “zoom out” and view all the clips you’ve got backed up in your library you’re reminded of the mammoth amount of work still left to do. I’m not saying you shouldn’t “zoom out” at all. That’s what your weekly review is for. Instead try to limit how much you zoom out on a daily basis. The way I see it is that during the week you should be in “worker bee” mode and hustling away on the jobs that need to get done. Then at the end of the week when conducting your weekly review you can go into “boss mode” and zoom out to review the big picture that you’re working towards. When you’re “zoomed in” and working on smaller tasks, focus on making small improvements each and every day. If you can make a little bit of progress, no matter how small, you should be pleased with yourself. Doing something on a daily basis also means you don’t have to try to catch up and do a whole lot of stuff at the end of the week. Don’t worry about climbing Everest. Just concentrate on putting one foot in front of the other. When you step back every now and then and look at how far you’ve come you’ll wonder where the time went. I remember starting my website about 12 months ago and thinking how great it would be to have a loyal and dedicated audience. Every day I would get up early to chip away at small tasks like writing blog posts, drafting emails and tweaking my website. Now when I look back I’m amazed at how fast the time has flown by and how far I’ve come. Don’t get me wrong, I still have a long way to go, but those little steps have really added up to what feels like a lot. Finding your next action simply means identifying the single task that you need to complete in order to move a project forward. For example, if you’ve got an idea of a website you’d like to start, there are a number of things you need to do. You need to set up each of the pages. Before that you’ll need to set up the site on a content management system like WordPress or Squarespace. Before you do that you’ll need to register a domain name. But before you can even register a domain, you need to think of a name for your website. So in order to build your website, your next action is to think of a name for the site. Identifying your next action and combining this with the advice above; making small improvements each day you can make regular and consistent progress towards your larger goal. Finally, when you set your long-term goals, be careful not to set them too far away. The problem with an annual goal (like new year's resolutions) is that the feedback loop is huge. Meaning you may not know if you’re making quality progress towards your goal until you’re perhaps 6 or 9 months down the line, by which time you’ve already invested a tonne of time and effort into your goal. This is why I like setting 90 day goals. The feedback loop is much shorter and this keeps momentum high. You can see much quicker how you’re doing and it’s easier to identify the steps you need to take to reach a 90 day goal compared to an annual goal. This isn’t to say you should have an idea of the things you want to achieve on a yearly basis. But consider breaking up your goals into shorter sprints that you can complete in 90, 60 or even 30 days. You can also challenge yourself to do things that you would normally give yourself 6 months for and try and smash it in 90 days. You’ll be surprised how often you can do this. Next time you feel daunted by a massive goal or project you’re working on, go through the following steps to focus in on the things that matter. Why not click the Evernote button on the left (bottom on mobile) and save this post for a rainy day. I’m also a big fan of sharing my goals with people as this increases accountability. I’ll share mine of you share yours. Deal? Your turn! Comment with your goals below!